In the mid 1950s NATO (North Atlantic Treaty Organisation) issued a specification for a lightweight strike fighter powered by a single Orpheus turbojet. In France, the Ministere de l'Air drew up a parallel specification for an aircraft which differed essentially from that called for by NATO in having paired lightweight turbojets. Dassault prepared a basic design to meet both requirements, and evolved a third version of the design as a private venture. The three versions of the aircraft were designated Etendard (Standard) II, IV and VI, and the first to commence its flight test programme was the Etendard II. Three prototypes had been ordered by the French government and the first of these flew on 23 July 1956. 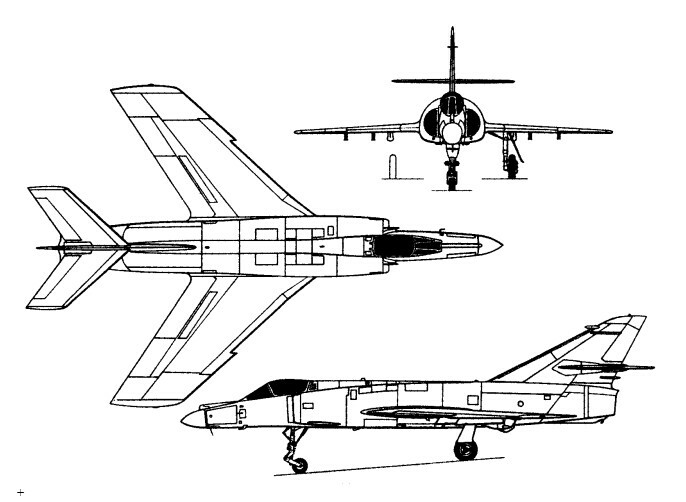 Competing with the Breguet 1100, the Etendard II was powered by two 940kg Turbomeca Gabizo turbojets and proposed armament included two 30mm cannon which were to be installed as a pack interchangeable with one containing 32 Matra 105 68mm rockets. It was intended to fit the Gabizo engines with afterburners, but as these were producing 160kg less dry thrust than promised and aircraft performance was, in general, disappointing, the programme was discontinued in November 1956, the second and third prototypes being cancelled. The second prototype was to have had 1200kg SNECMA R-105 engines. Developed in parallel with the Etendard II and VI as a private venture, the Etendard IV light tactical fighter powered by a 3400kg SNECMA Atar 101E-4 was first flown on 24 July 1956. The Etendard IV featured larger overall dimensions, including 1.4sq.m more wing area, cabin pressurisation and longer-stroke main undercarriage members with larger wheelbase and track. There was provision for increased internal fuel capacity. The armament of the sole prototype Etendard IV comprised two 30mm DEFA cannon. Several variants of the Etendard IV were planned, including a tandem two-seat conversion trainer, a tactical reconnaissance model and a shipboard multi-role fighter version. Intended to meet the NATO requirement for a light tactical fighter, the Etendard VI was flown for the first time on 15 March 1957, three prototypes having been ordered in July 1955. Initially, the first prototype was powered by a 1700kg Bristol Siddeley Orpheus BOr 1 turbojet, but this was later to be replaced by a BOr 3 of 2200kg. Armament consisted of four 12.7mm machine guns and up to 540kg of ordnance could be carried on wing pylons. The second prototype, powered by the BOr 3 from the outset, had enlarged air intakes and an internal armament of two 30mm cannon, and was first flown on 14 September 1957. Both Etendard VIs participated in the NATO Concours at Bretigny-Chateauroux, from which the Fiat G.91 emerged as the winning contender. Construction of the third prototype, which was to have had a 2700kg BOr 12 engine with provision for afterburning and a fully area-ruled fuselage, had been terminated in June 1957. Both prototypes subsequently participated in the Etendard IVM development programme. It was for the shipboard multi-role Etendard IV fighter that Dassault received a contract for the further development to meet the Aeronavale's requirements. An order was placed in December 1956 for a semi-navalised prototype, this being followed on 31 May 1957 by a contract for five fully-navalised pre-production examples under the designation Etendard IVM. The prototype flew on 21 May 1958, followed by the first pre-production example on 21 December, both were powered by the 9,700 lb / 4400kg SNECMA Atar 08B turbojet. 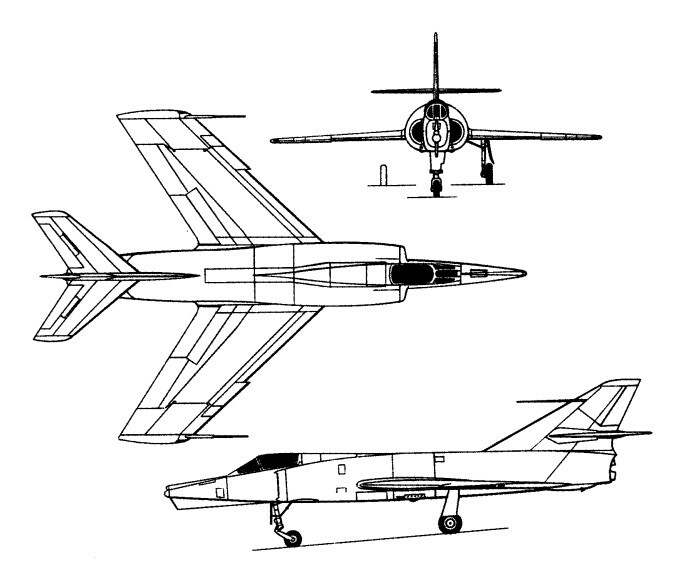 The pre-series Etendard IVM featured folding wingtips, a strengthened, long-stroke undercarriage, an extendable nosewheel leg, catapult spools and an arrester hook. Speed was in excess of Mach 1 at optimum altitude, and armament includes one or two 30-mm cannon and up to 3,000 lb (1,360 kg) of bombs, rockets, AS.30 air-to-surface or Side-winder air-to-air missiles carried underwing. By comparison with the original Etendard IV, the IVM had 15.5% more wing area and a larger rudder. The second pre-production aircraft was completed with an 5080kg Rolls-Royce Avon 51 engine and blown flaps as the Etendard IVB. Early in 1960, a series of catapult take-off and deck-arrester trials was carried out at RAE, Bedford, with the Avon-powered Etendard IVB. The fin-like antenna under the nose is associated with the guidance system for the beam-riding Nord 5103 missile. In 1960, 100 Atar-powered Etendard IVMs were on order for service aboard the new French carriers Clemenceau and Foch. Delivery of this version to the French Navy began in June 1978. Powered by an 11,025 lb thrust SNECMA Atar 8K-50 turbojet engine, it incorporates advanced high-lift devices and a highly sophisticated electronics system. Armament includes two 30-mm cannon and up to 4,630 lb (12,100 kg) of air-to-air/air-to-surface missiles, bombs, etc. Normal powerplant for l'Aeronavale is the 9,700-lb. s.t. SNECMA Atar 8 turbojet, and the excess power of the Avon--engined Etendard is used for leading- and trailing-edge flap blowing for operation from smaller aircraft carriers than the new French types, if required. 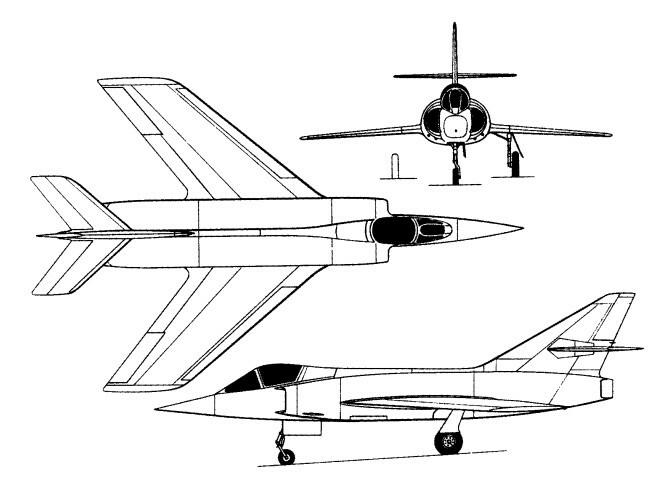 One additional pre-production aircraft was ordered in September 1959 and completed with a camera nose as an Etendard IVP. During flight trials, the Etendard has flown up to M1.44 in a dive. Level flight speed is just over M1, and the practical limit is M1.3 or 670 knots. In addition to its fixed guns, the Etendard has four under-wing attachment points for bombs, rocket pods, Nord ASMs, fuel tanks or other external stores, and the IVB has provision for an additional pylon beneath the fuselage. With two 1,000-lb bombs and cannon armament and full internal fuel of 660 Imp gal., the Etendard takes off in 1,650 ft. at 21,000 lb., or has a catapult end speed of 116.5 knots, and has a 400nm radius of action. Maximum weight of the Etendard IVB is 22,500 lb., and it climbs to 40,000 ft. in 4 min. 20 see. Acceleration from 250-600 knots requires only 53 sec, and normal NATO naval strike equipment is fitted, including LABS and TACAN. Sixty-nine IVMs (plus 21 IVP tactical reconnaissance aircraft) were delivered between 1961 and 1965, for both intercept and tactical strike roles from French carriers Clemenceau and Foch. Armament consisted of two 30mm cannon and a variety of underwing ordnance. The Etendard IVM remained in Aeronavale service until 1991, being succeeded by the Super Etendard. To complement the Etendard IVM, the French navy needed a photo-reconnaissance version. This was the Etendard IVP that first flew in November 1960, and production totalled 21 aircraft for Flottille 16F. In the Etendard IVP, the attack fighter’s Electronique Serge Dassault Aida ranging radar and Saab toss-bombing computer are replaced by a nose installation of three Omera cameras, while another two cameras replace the attack fighter’s two ventrally mounted 30-mm cannon and their ammunition. 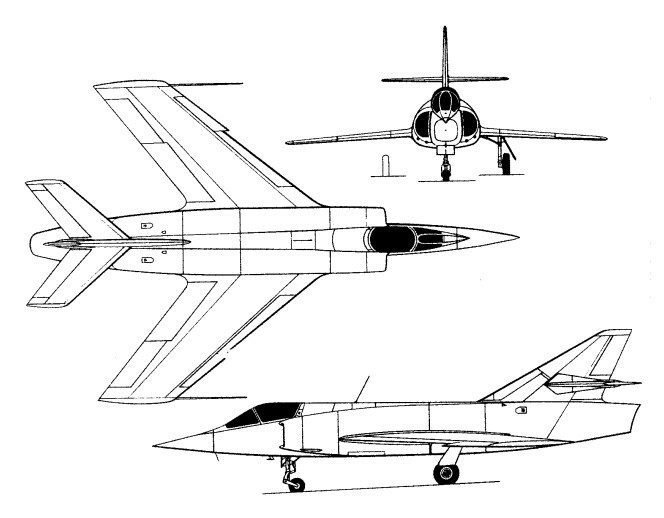 The Etendard IVP is equipped with a nose-mounted inflight refueling probe, and can also carry a Douglas-designed “buddy” refueling pack on the centerline under the fuselage for the support of other Aeronavale fixed-wing aircraft, notably the Super Etendard development of the Etendard IVM. The first of three development aircraft for the Etendard IVM carrierborne attack fighter (converted from Etendard IVM airframes) flew on 28 October 1974, with revised powerplant, comprehensive high-lift devices and inflight-refuelling capability. The first pro-duction example of the Super Eten-dard single-seat carrier-based strike fighter on 24 November 1977. Initial deliveries to the Aeronavale began on 28 June 1978. The Super Etendard had a built-in armament of two 30mm cannon and various external ordnance loads on five stores stations. By comparison with the Etendard IV-M from which it was developed, the Dassault Super Etendard introduced more advanced high-lift devices, a 5000kg SNECMA Atar 8K-50 turbojet of increased power, Agave radar in an enlarged nose and an entirely new nav/attack system with the AM.39 Exocet missile. French Navy Super Etendards were to be modified to carry the ASMP nuclear missile, and 50 aircraft were scheduled for completion by the end of 1988. Fourteen were ordered by Argentina and the Super Etendard was employed operationally from shore bases in May 1982 during the Falklands conflict. Seventy-one Super Etendards were supplied to the Aeronavale, production terminating in 1983. The prototype of an upgraded version of the Super Etendard was flown on 5 October 1990, when it was proposed that a further 54 would be upgraded to similar standards (two by Dassault and 52 by Aeronavale's Cuers workshops) at a rate of 15 annually from 1992, to extend the service life of the Super Etendard to the year 2008. The upgrade programme included both airframe modifications and avionics updating. Armament: two 30mm DEFA cannon. Climbs to 40,000 ft: 4 min. 20 see. Engine: one 9,700-lb (4,400-kg) thrust SNECMA Atar 8B turbojet. Maximum take-off 22,486 lb (10,200 kg). Radius: 186 miles (300 km). Engine: 1700kg Bristol Siddeley Orpheus BOr 1 turbojet, later BOr 3 of 2200kg. Engine: 1 x Snecma Atar 8K50. Wing area: 306.774 sq.ft / 28.4 sq.m. Initial ROC: 6000 m / min. Combat radius hi-lo-hi: 720 km.